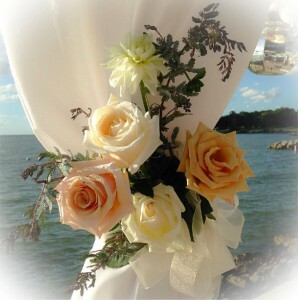 Located on the shores of Lake Erie in downtown Port Clinton Ohio, Mary’s Blossom Shoppe has provided the freshest flowers in the most distinctive designs since 1978. A diverse assortment of refreshing cut blooms arrive daily. Lush green potted plants and blooming gardens are available on request. Because each arrangement is custom designed, we prefer you phone us with your order. We’ll personally assist with choices for great seasonal picks, color selection and those “extras” that you might not have thought of. Every detail will be addressed to your satisfaction. Locally we deliver to Port Clinton, Catawba Island, Lakeside-Marblehead, Gypsum, Put-in-Bay, Kelley’s Island, Sandusky and Oak Harbor. Add one or more to your floral gift delivery or just stop in to shop for yourself!